Self-styled “True Norwegian Balkan Metallers” TROLLFEST, who recently inked a deal with NoiseArt Records, as well as the booking agency Rock the Nation, have today previewed the artwork and track listing for the forthcoming album, “En Kvest For Den Hellige Gral”, which is due for release in April. 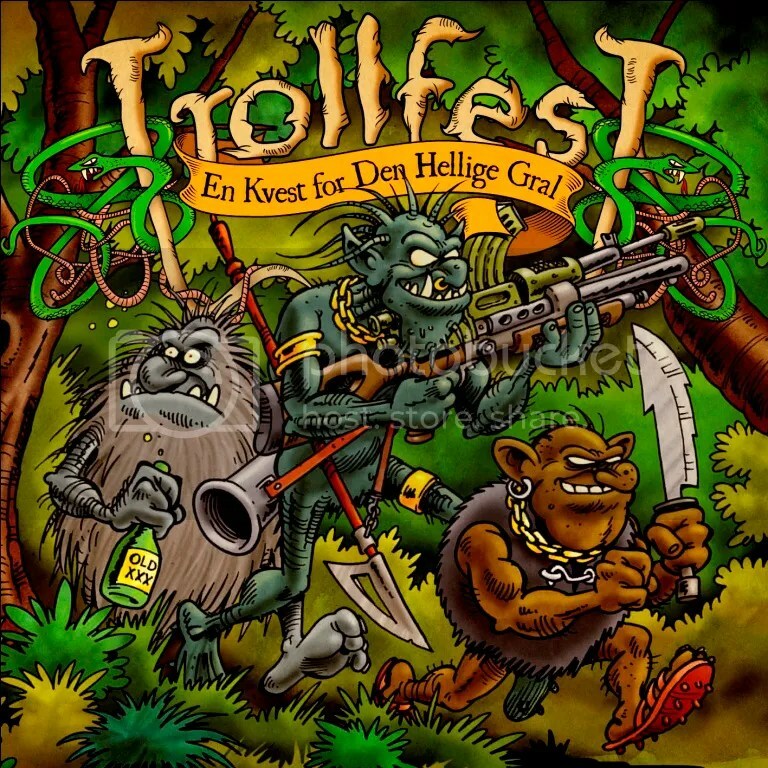 “Just like our second album “Brakebein”, “En Kvest For Den Hellige Gral” is also a concept album, which this time centres on the story of five Trolls who set out on a quest to find the Holy Grail that will reputedly deliver all the Trolls from a horrible famine. Exactly how it will do this is not by some heaven sent miracle, but by providing an endless food source in the shape of the hordes of Christians who will come searching for the Holy Grail themselves! As you can imagine, this rather “unholy” quest is a somewhat beer-fuelled, blood-soaked adventure in typical Troll tradition! And if you want to know what happens next to the brave questers, there is an epilogue in the form of bonus track on the digi pack edition. “When it came to actually illustrating the story of our five brave and adventurous Trolls for “En Kvest For Den Hellige Gral”, there was only one choice we could possibly make, and that was Jonas Darnell. Ever since he created the evil Iron Duck for our “Villanden” album, Jonas has been bringing the characters of the TrollfesT universe to life through his art. It then falls to Terje Johnsen to design and put together all of Jonas’ wonderful creations into a spectacular package. Terje has been part of the TrollfesT crew since Brakebein, and his work has earned him the honorary title of ‘Andy WarTroll’”.